Here I’m trying out the latest in EEG fashion. I think the red conductive gel-glue really brings out my eyes. I was scheduled for an EEG and MRI, in attempts to try to find out what’s been ailing me. The EEG was…Interesting. I’d never had one before, so I didn’t really know what to expect. For those of you who don’t know what happens, I’ll lay it out for you. First, a nervous intern measures your head and scribbles lines with what feels like a wax pencil in random spots all over your head. They use those lines to plot where the two dozen or so electrodes are to be placed. Before the nodes are placed, the intern scratches the crap out of your scalp, to (supposedly) remove the dandruff and make it easier for the conductive gel-glue to do its thing. (For the record, it doesn’t seem to matter if you washed your hair before the test or not, because they’re going to scratch the crap out of your scalp anyway.) The electrodes are held in place with a water-soluble conductive gel-glue. Then the lights in the room are dimmed, you’re reclined back, given a nice, warm, comfy blanket and told to keep your eyes closed. Obviously, this is meant to relax you and potentially induce sleep. Just as you begin to fall asleep, the EEG technician yells or makes some other loud noise to scare the unholy crap out of you, then assaults your eyes with strobe lights (while your eyes are still closed). After that, they monitor your brainwaves for a few more minutes before turning the lights back on and somewhat sensually removing the electrodes. It kind of make you feel like a dirty, dirty girl. Well, at least that was my experience. Yours may differ. Next, I was escorted to the MRI room. 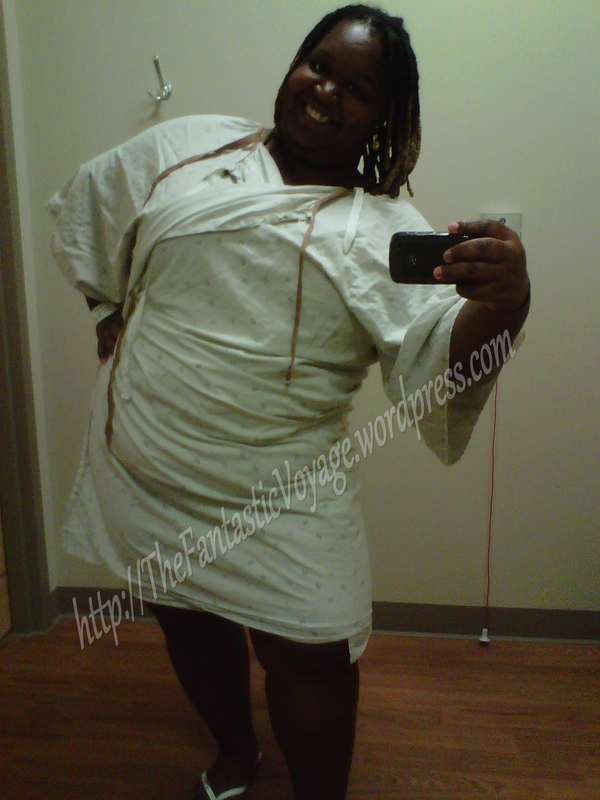 The hospital “gown”. If I wear this beauty out, I’m sure all the women will be jealous. Expect to see this look on the runway in 2013. Also, peep the matching thong flops. You volunteer yourself to lay down and be sent through a time warp machine that looks like a GIANT friggin’ donut and sounds like a dryer with lightning bolts and boulders tumbling around inside. They try to make you more comfortable by giving you some headphones so you can listen to music while you’re inside the MRI, but once the testing begins those headphones are POINTLESS. But, here is an exciting picture of my BRAIN! This is what laying inside of a giant donut gets you – a freakish picture of your insides. But if you ask me, that’s a pretty awesome looking brain. 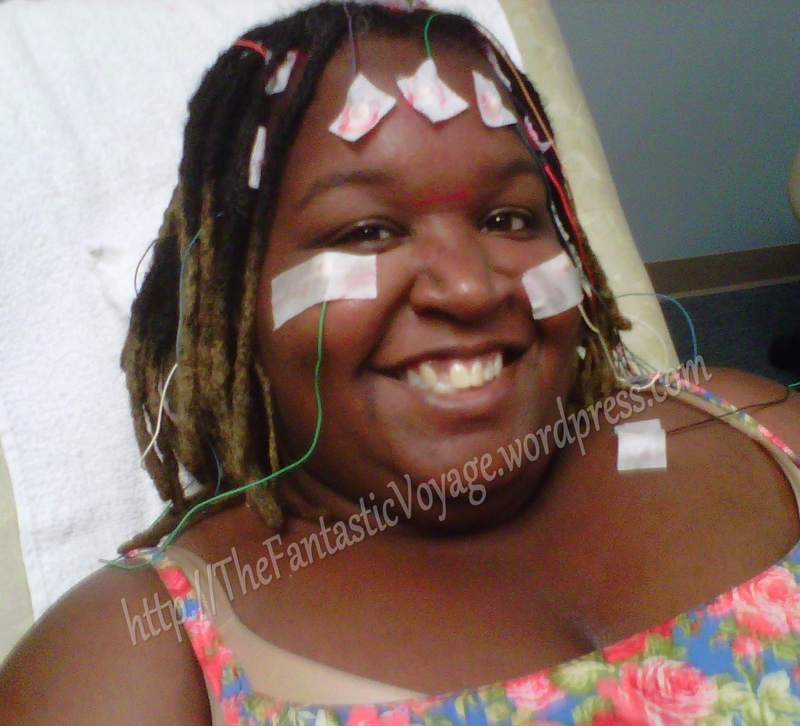 I haven’t gotten the results of my EEG or MRI yet, I plan to get those results next week. I pray that these tests provide some type of answer. 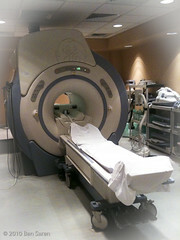 Have you ever had an EEG or an MRI done before? 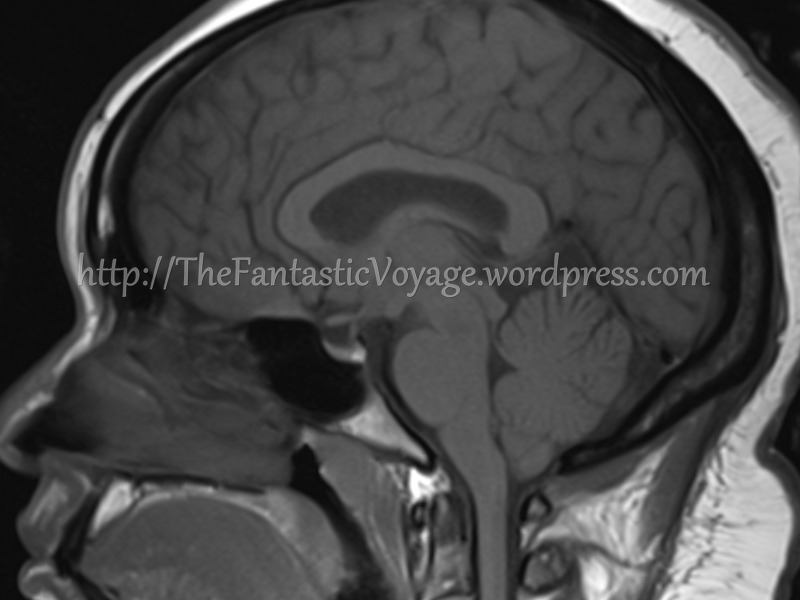 Does your brain look as awesome as mine does? Let me know, leave a comment below!